A version of this article originally appeared on Cyber PR. The discussion of the intersection between independent musician and entrepreneur isn't a new one. Both are responsible for shaping their own careers, building their own teams, setting their own goals, and working towards the proper milestones that will turn dreams into reality. 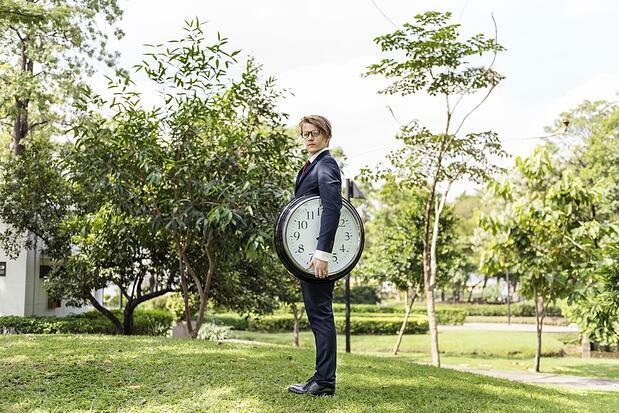 Musicians and entrepreneurs also suffer from a similar issue: time management. And rightfully so. Whether you're a solo artist working on your own or have a band that you can share the responsibilities with, the amount of time it takes to get through the never-ending task load can very quickly surpass the number of hours in a day, week, or year. Below are five tactics that have been an immense help for me personally to manage my time effectively. Mapping out your plan isn’t just essential, it's literally the answer to effective time management. It's the foundation on which the rest of your time management strategies are built, so let’s discuss this one first. Whether it's at the top of the year, quarter, month, week, or day, you should have a plan of attack. A content schedule for social media content (tweets, Facebook posts, YouTube videos, blog posts, newsletters, etc. ), new music releases, show dates, etc. It’s important to understand that not all of your tasks hold the same weight. By treating all of your tasks as equally important, you are adding unnecessary stress to your day, because while you work on one task, you'll naturally feel as though there's something else you need to be doing or checking. Last year, I read a book by Brian Tracy called Eat That Frog!, and it was transformational. The concept is very simple: take a look at all of the tasks you have to do, determine which tasks are most aligned with your goals, and do those tasks first. Whether these are daily tasks required of you that you’ll do when you wake up, or weekly tasks that you’ll handle as soon as you dive in on Monday morning, by accomplishing the most important tasks first, you're removing the stress and resistance of handling other tasks later on because you know you’ve already handled the things that are most critical. ". . . We have scales that allow us to divide up people into people who multitask all the time and people who rarely do, and the differences are remarkable. People who multitask all the time can’t filter out irrelevancy. They can’t manage a working memory. They’re chronically distracted." I found myself becoming a slave to my email inbox. I was not only making it a priority (a big mistake!) over other tasks, but I was constantly checking it while doing other things, which meant that my focus on any other task was consistently being interrupted. By holding off on checking my inbox and carving out time for just email, I was able to get through my inbox in an hour or so, instead of the three that it would take me checking it off and on throughout the day. This same tactic can be used for social media engagement, blog reading/writing, music studies, or music writing, etc. There are many small tasks that we have in our daily lives that we simply must do to maintain our vision, presence, brand, schedule, etc. Most of these small tasks, such as sharing your most recent blog post to Facebook and Twitter, are harmless on their own, but when added up together can take a significant amount of time out of your day and a significant amount of focus away from your prioritized task list. Enter If This Then That (IFTTT). This platform allows you to batch and automate tasks through a very simple process of connecting your digital channels (at the time of this writing, there are 79 channels available for you to connect) and answering the simple equation, "if ___, then ___." In other words, If [a new blog is published to my WordPress blog], then [share the link on my Facebook fan page]. On Hypebot, Clyde Smith recently published a fantastic walkthrough of IFTTT, which I highly suggest you read and get yourself set up with. Are you a procrastinator? It’s okay to be honest here – most of us are. A few years ago, I read a book called The War of Art by Steven Pressfield which focuses on the concepts of "resistance" in our daily lives and how that leads us to procrastinate from "going pro," which is to approach our work from a professional and focused view. If you feel like you're procrastinating more than average, and it’s holding you back from accomplishing your goals, I strongly suggest you read this book. It'll help you, as it helped me, to identify the areas of my life that were causing resistance and how to remove (or correct) those issues so I could work at going pro.